Acer being the third largest vendor of laptop pc has once again made its mark by the launch of Acer Ferrari 1200 laptop pc. Every detail provided by Acer in the 1200 laptop pc truly conveys the feel of a F1 racecar. From the carbon-fiber cover (the material that is actually used in racecars) to the soft-touch coating and the velvety texture that resembles with the interior of a Ferrrai. The Acer Ferrari 1200 laptop pc is powered by an AMD Turion X2 ultra dual core mobile processor. Not only this, the Ferrari 1200 has AMD M780G chipset with graphic capabilities. Also the Ferrrai 1200 laptop pc comes with up to 4GB of DDR 2 memory, and a SATA hard drive for excess storage space. 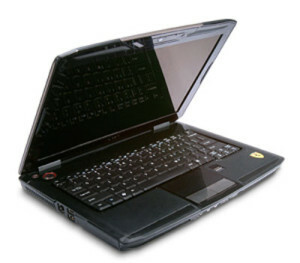 Ferrari 1200 laptop pc has a slot-load optical drive, a Dolby Home Theater sound technology, and 802.11 WiFi technology. And speaking of the display, it has a 12.1 inch wide screen high resolution display. Acer has provided a wireless mouse and an optional VoIP phone. In all, the latest article by Acer in Ferrari series is ready to get throttled. Out of a Ferrari I get two things – style and power. Given that Intels current chips are beating AMDs ones hands down and that the laptop looks as ordinary as any other – this laptop fails to have style or power. Given that this laptop sells for a premium, putting a lower powered (and priced) AMD CPU means they end up with more profit over a more powerful yet more expensive Intel one. The very first Acer Ferrari laptop was good – great style and spec for the time, but every version since then gets considerably worse. It’s like they don’t even make the effort anymore.